Music Together of Bay Ridge - What are Music Together classes? 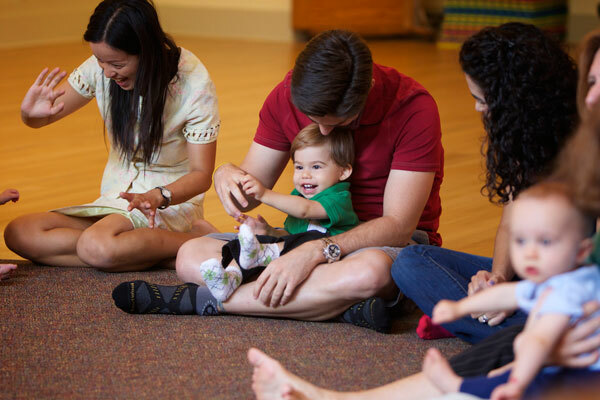 Twelve babies, toddlers, preschoolers, and their parents or caregivers meet weekly in a 45-minute class to sing songs, dance, play with simple musical instruments, and have fun with nursery rhymes, fingerplay, lap songs, rhythm games and a rich variety of other music and movement activities. Both adults and children sit in our circle together and participate, led by a teacher specially trained in early childhood and music skills. Classes are informal and designed to be lots of fun, so the adults, regardless of their musical ability, feel comfortable and encouraged to sing, dance, and play as part of the group - giving the children a joyful experience of group music-making. The children are free to participate, or not, in any manner which suits them that day. Some may choose to "just" sit and watch, absorbing and studying the rich musical environment, while others may choose to move and sing for different portions of the class. What the children observe in class continues at home -- each family is given two copies of a professionally recorded CD featuring the Music Together Band, an access code for downloading or streaming the songs, and an Illustrated Songbook, containing all the songs we'll be singing during the semester. The classroom experience is just the start -- the joy of family music-making continues at home all week long! 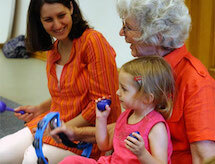 Check out some video clips about Music Together classes!